Welcome to Brad's A.T. Walk - 2009! Total Miles Walked = 2178.3 Only -0.00 Miles To Go! This morning, Thursday, 10-22-09, I resumed old habits. I sorted and stored hiking gear, did a load of laundry, washed my filthy backpack and drove to McDonald's for an Egg McMuffin Meal and a senior coffee. I'm typing this report while waiting for my oil to be changed at the Hinkleville Road Wal-Mart in Paducah, a fitting re-introduction to the real world. 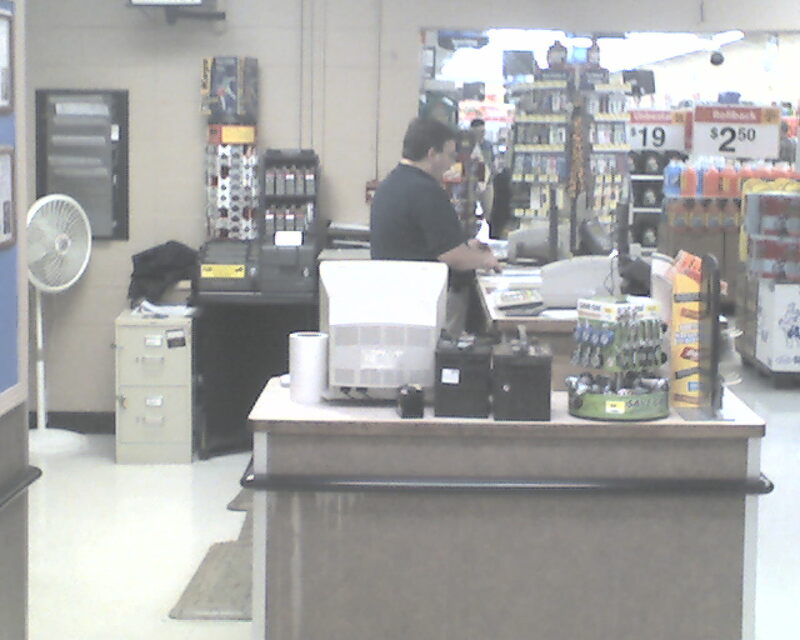 Today's photo is the Tire & Lube Express check-out counter. Everything seems normal and right. Thanks to all of you that prayed and offered encouragement. It meant more than you could know. Thanks also to Gil and Glen for taking care of my home, personal and business affairs, and trail logistics. Thanks to all the many, many generous, helpful folks that we met along the trail. And, lastly I thank the Lord for providing me with the opportunity, resources and good health to pursue and accomplish "the desire of my heart." I will finish with this simple testimony. As many of you know my 2007 AT through hike was curtailed after 1,260 miles by a tick bite that resulted in a severe case of Lyme disease. This year many hikers that we met or heard about contracted Lyme disease (maybe more than in 2007). First hand reports of an abundance of deer ticks were rampant. But here's the truth. Neither Flaxseed nor I saw a single deer tick or dog tick; not one. I'm not talking about a seeing an "attached tick." I'm telling you that we saw no ticks anywhere; not on the ground, not on a limb, not on a leaf, not on a log, not on our clothing, not on our skin, nor in our hair - nowhere. Now, if you have an explanation other than God, in His abundant grace and mercy, providing an old sinner who loves Him "the desire of his heart" please email, or write, or call. I'd like to know what it is. Epilogue: It would be premature to post an epilogue now. Post-AT adjustment, including time to reflect, will take time. If more comments are needed I will add them later. God bless you all. And God bless my good friend, Flaxseed.